Boy, are there some shocking people in Canada's chapter of the tobacco control sect. Public health officials and regulators who have battled for years against smoking may be inadvertently bolstering the tobacco market with their strong stand against e-cigarettes, some financial analysts say. It seems that, because of insane self-enriching public health wingnuts, a German bank has advised its investors to sell their granny and pile into buying tobacco stocks. The reason? Because public health's assault on e-cigs can only have one possible outcome. The three London-based analysts who wrote the review say they are “more bullish on global tobacco than ever,” citing a variety of factors. One is that the threat to conventional cigarettes from e-cigarettes seems to be shrinking, partly because public-health officials are casting doubt on their safety and restricting their use. “Our medium-term view is that the regulators have reinforced the position of [conventional] cigarettes for many consumers,” they say. That's banking speak for "public health has successfully scared people away from e-cigs so smokers will carry on smoking. Buy, buy, BUY tobacco shares!". Way to go, tobacco control! Indeed, the German bankers are very wise, because this scenario has already been played out in Spain. 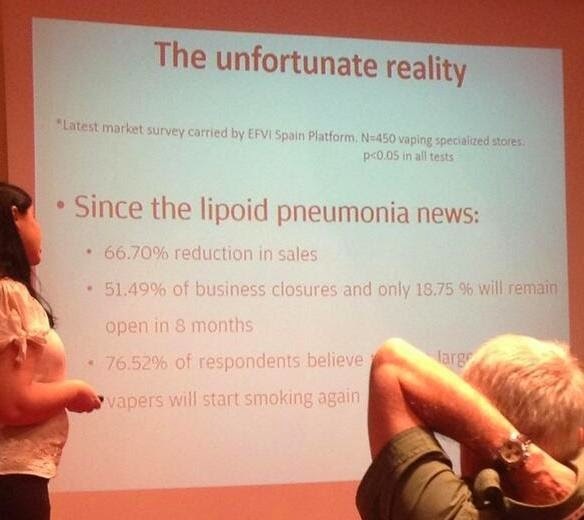 After a baseless but much publicised scare story, e-cig sales fell off a cliff and the number of recorded Spanish vapers fell from 800,000 to 200,000 almost overnight. Now, what do you think the other 600,000 did with their cash? Stick in the piggy bank or go back to buying tobacco? Catastrophic news for public health and a lesson to be learned, you'd think, wouldn't you? But the Canadians who want to replicate this effect are unrepentant. One of those public-health advocates said she makes no apologies for criticizing e-cigarettes, arguing there is zero evidence they are any safer, and that they could ultimately allow tobacco companies to create even more harm. Translation: We didn't invent them and they threaten my salary, so screw health, I have a career to think about. We will see a lot more of this attitude in coming months. You see, the WHO's latest anti-tobacco shindig is taking place in October and - while the rest of the world is condemning gay-hating, jet-destroying Russia - there was never even the slightest consideration that the global tobacco industry would cancel or relocate. Instead, the attendees will be excitedly lapping up the delights of Moscow and bolstering the Russian economy with our taxes. And when finished with their state-funded jollies, these unelected cronies will demand a policy of elected governments worldwide classifying e-cigs as tobacco products after trying their best to hide it. Truly, there is little more hideous in this world than the entrenched, blinkered, reactionary, hypocritical, petty, joyless, spiteful, self-centred and borderline criminal tobacco control industry. Careful, Chappers will be retweeting this and calling you names. You lost me at "borderline". Hey! Respect for the law please. Yes they should be in stir, but innocent till proven guilty and all that. we like lots of rules + signs everywhere to remind us of them and welcome more rules to keep us safe because we would be unsafe without them. thank you simon chapman from protecting us from tobacco companies and against the new scourge of dual-use inducing ecig tech. Very true. I quite liked the e cigs in places where I couldn't smoke, might well have changed to them but since they are being banned too might as well stick to the real thing. I wish 'smoking related' diseases on all the health fascists.